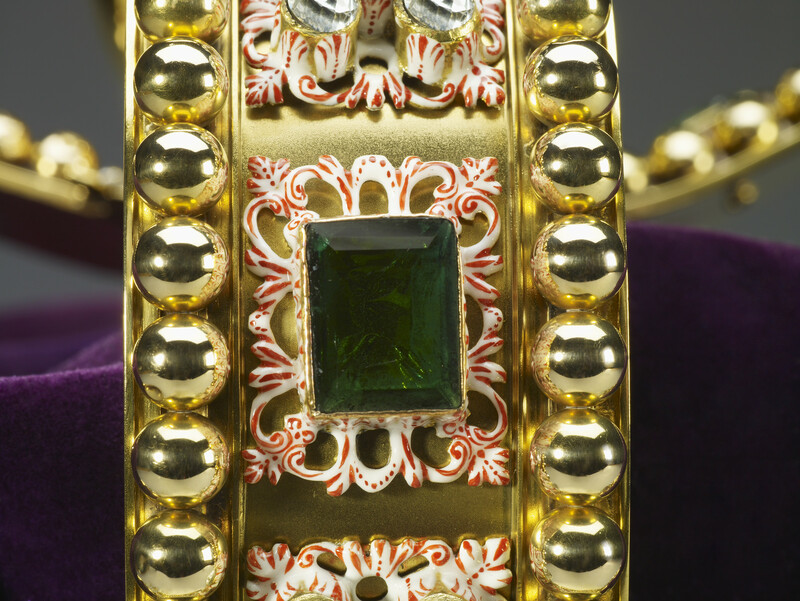 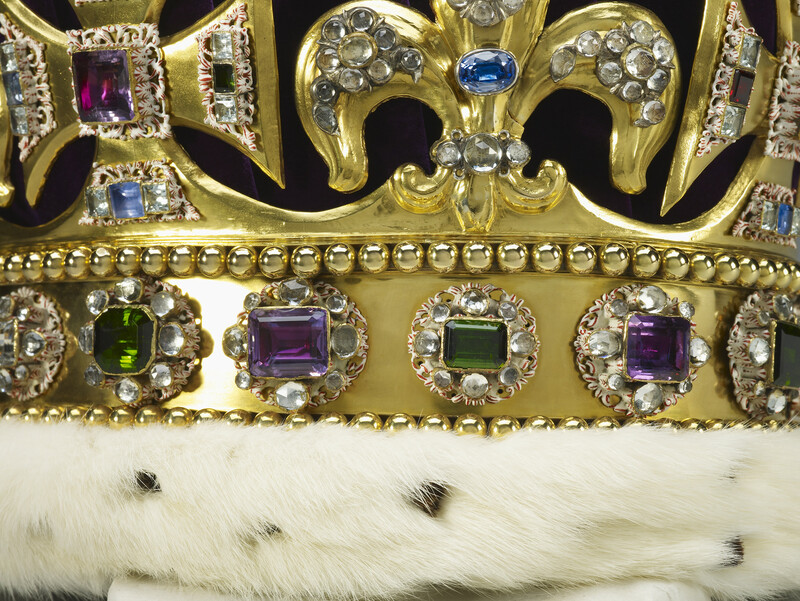 The crown is composed of a solid gold frame, set with tourmalines, white and yellow topazes, rubies, amethysts, sapphires, garnet, peridot, zircons, spinel, and aquamarines, step-cut and rose-cut and mounted in enamelled gold collets, and with a velvet cap with an ermine band. 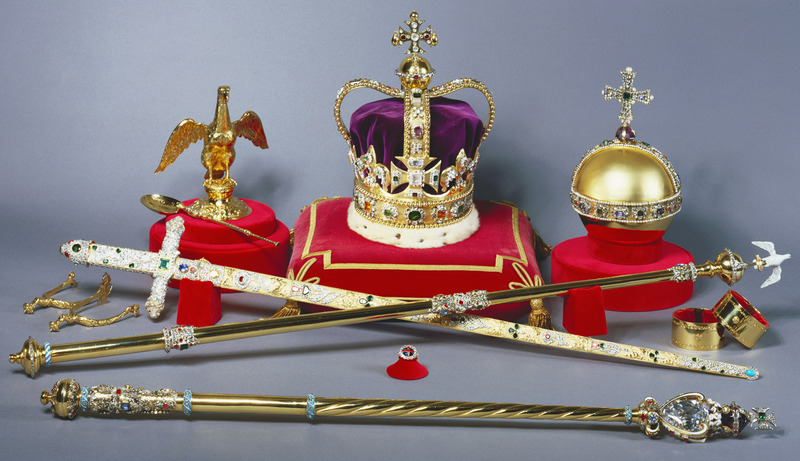 The band of the crown is bordered by rows of gold beads and mounted with sixteen clusters, each set with a rectangular or octagonal step-cut stone in a collet decorated in enamel with modelled acanthus leaves, surrounded by rose-cut topazes and aquamarines, mainly round. 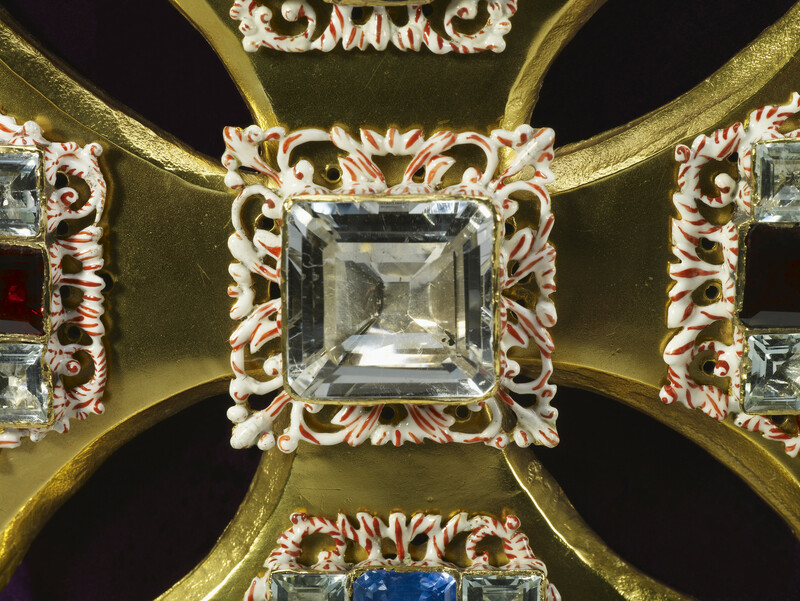 Above the band are four crosses-pattée and four fleurs-de-lis mounted with clusters of large step-cut stones and smaller rose-cut stones. 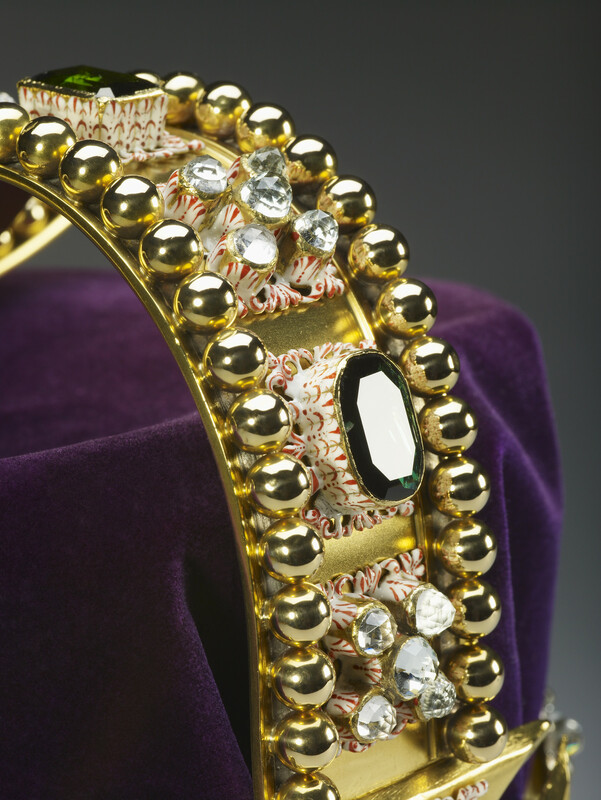 The two arches are mounted with gold beads (which replace earlier rows of artificial pearls) and applied mounts with enamelled settings, containing step-cut stones and clusters of rose-cut smaller stones. 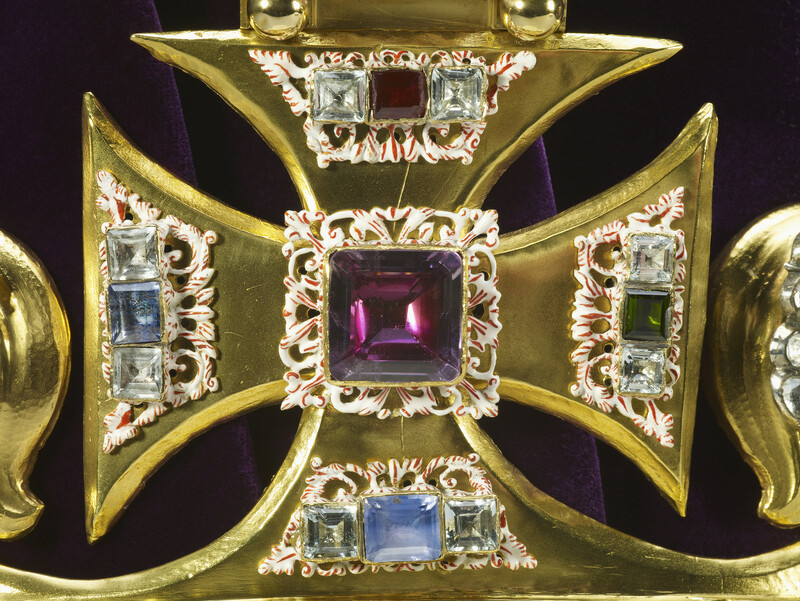 The monde, which was replaced in 1685, has similar mounts and gold beads and supports a cross-pattée, with drop-shaped beads and step-cut and rose-cut stones. 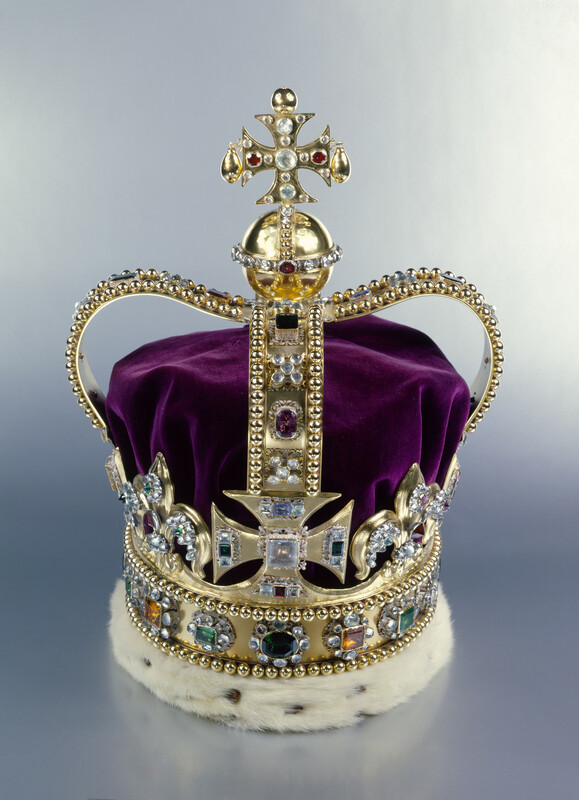 St Edward's Crown is the crown used at the moment of coronation. 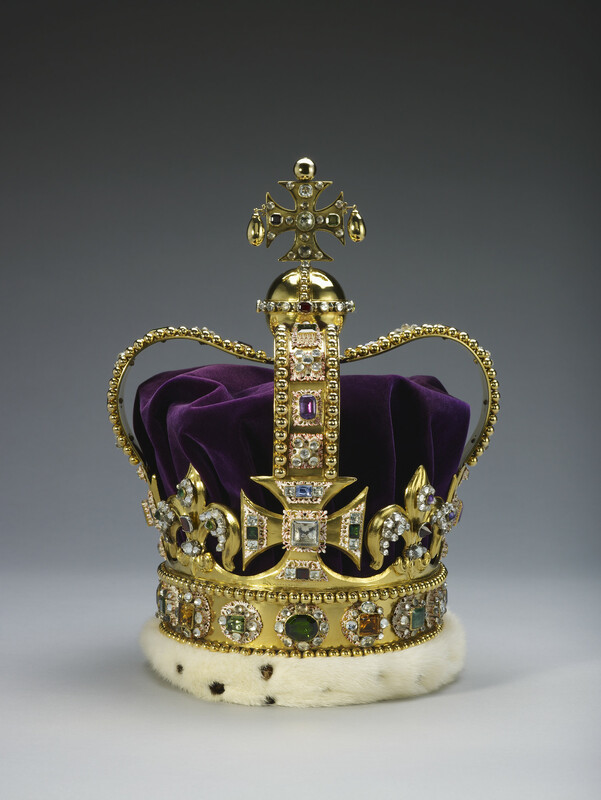 This Crown, which was made for the Coronation of Charles II in 1661, was a replacement for the medieval crown which had been melted down in 1649, by the Parliamentarians, and which was thought to date back to the 11th century royal saint, Edward the Confessor (St Edward), the last Anglo-Saxon king of England. 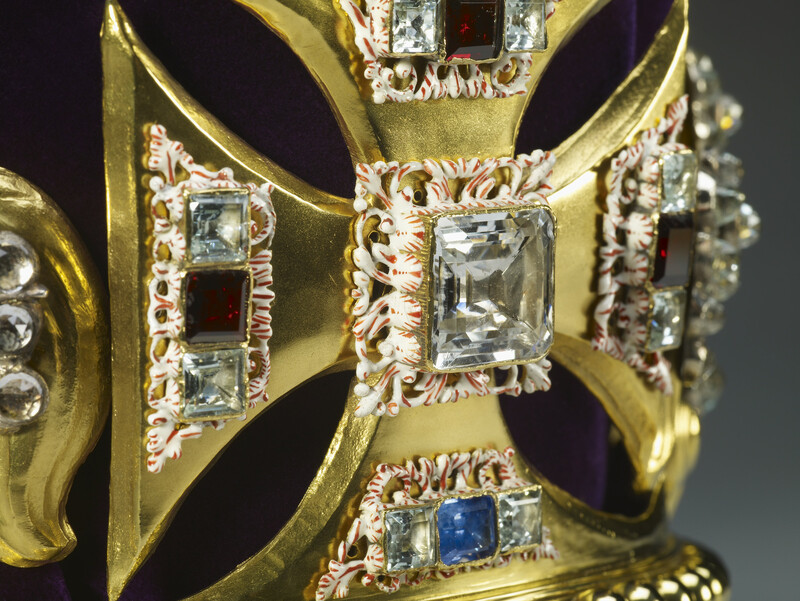 Although the 1661 crown follows the original in having four crosses-pattée and four fleurs-de-lis, and two arches, it was not a reproduction of the medieval design. 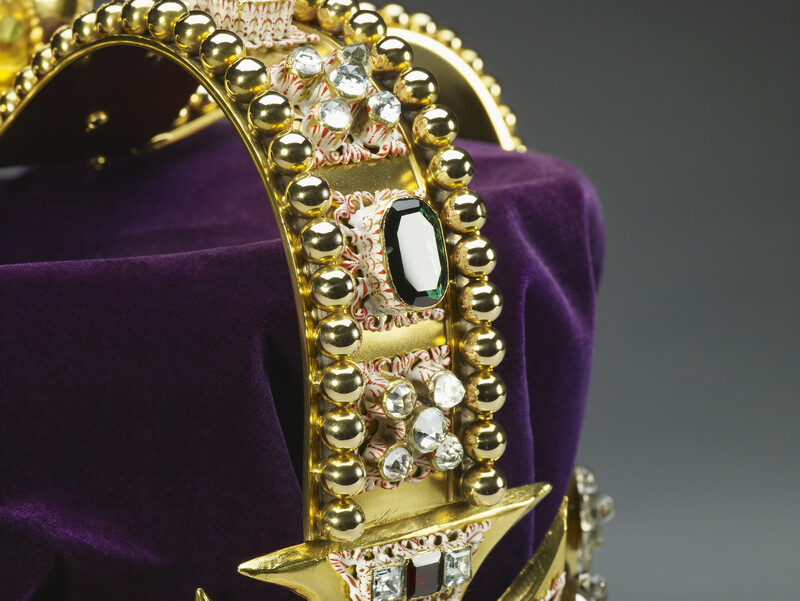 Until the early 20th century the stones adorning the crown were hired for the occasion of the coronation and then returned. 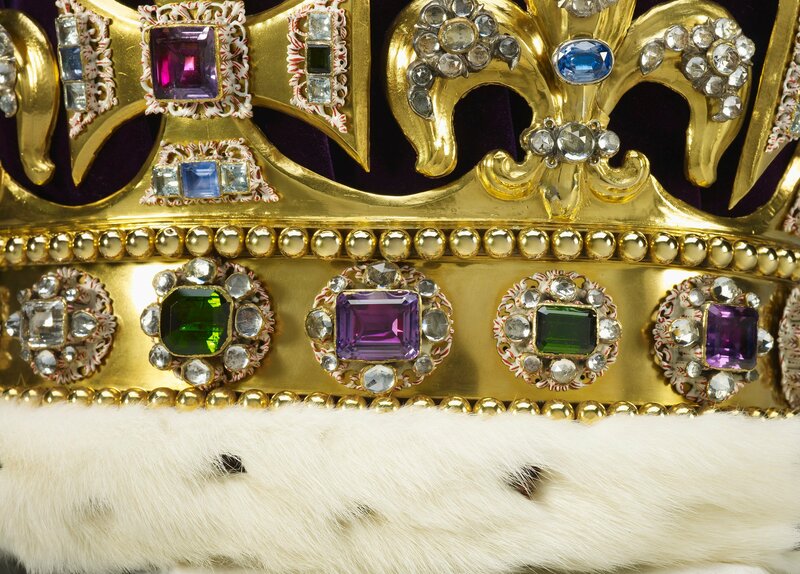 It was only in 1911, for the Coronation of George V, that the Crown was permanently set with its semi-precious stones. 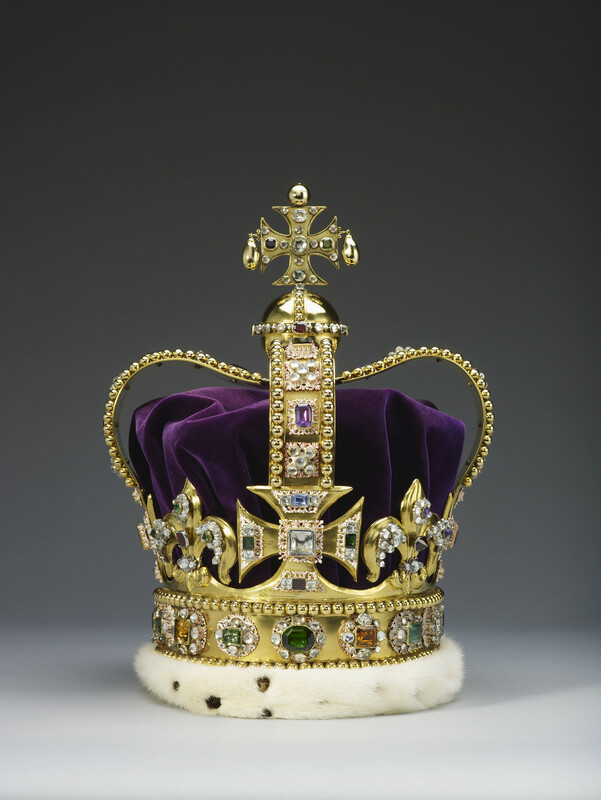 At the same time it was made lighter (although it still weighs 2.23 kg - nearly 5lb). 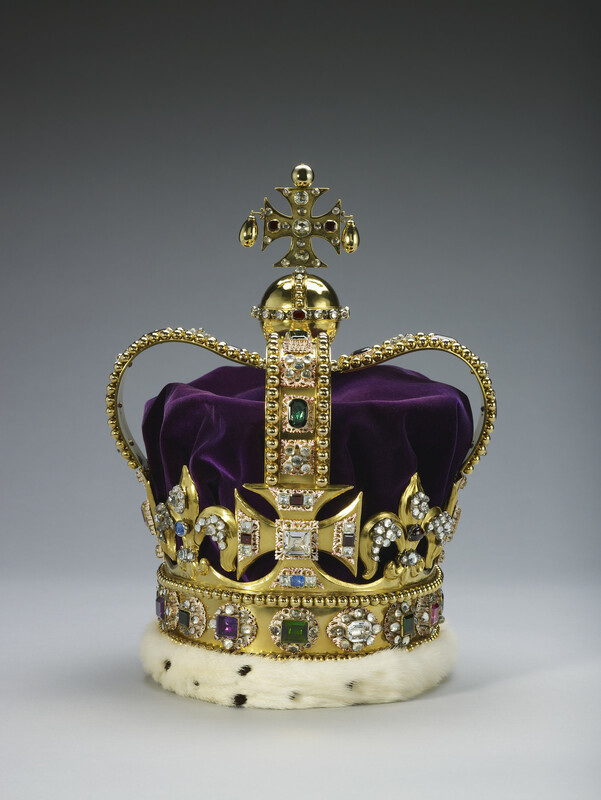 Because of its weight St Edward's Crown was not worn but carried in the coronation procession for over 200 years, from the reign of Queen Anne, and placed on the altar during the ceremony. 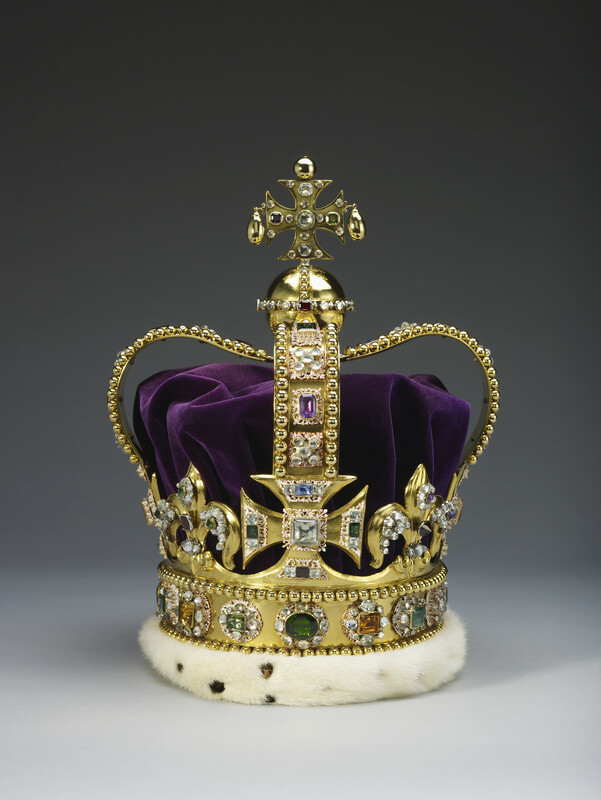 Commissioned for the Coronation of Charles II on 23 April 1661 from the Crown Jeweller, Robert Viner. 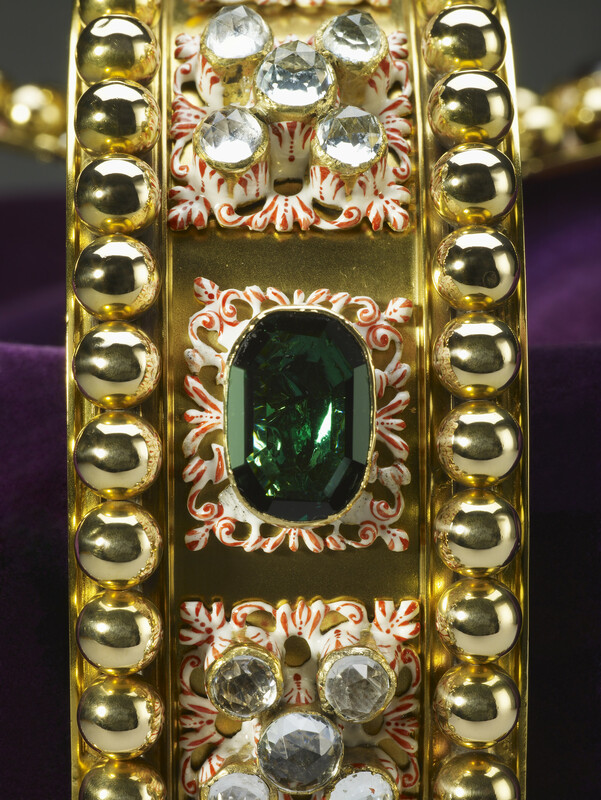 Gold, silver, platinum, enamel, tourmalines, topazes, rubies, amethysts, sapphires, garnet, peridot, zircons, spinel, aquamarines, velvet and ermine.